The episode opens with the Enterprise on red alert. Lieutenant Worf and Commander Riker are rushing to a warp nacelle tube where they encounter Lieutenant Daniel Kwan standing precariously close to the plasma stream. It becomes clear that Kwan plans to commit suicide, and Riker attempts to talk him down before he ultimately fails and Kwan takes his own life. This exchange opens a dialogue about mental illness the likes of which we don’t experience in Star Trek until the Voyager series. 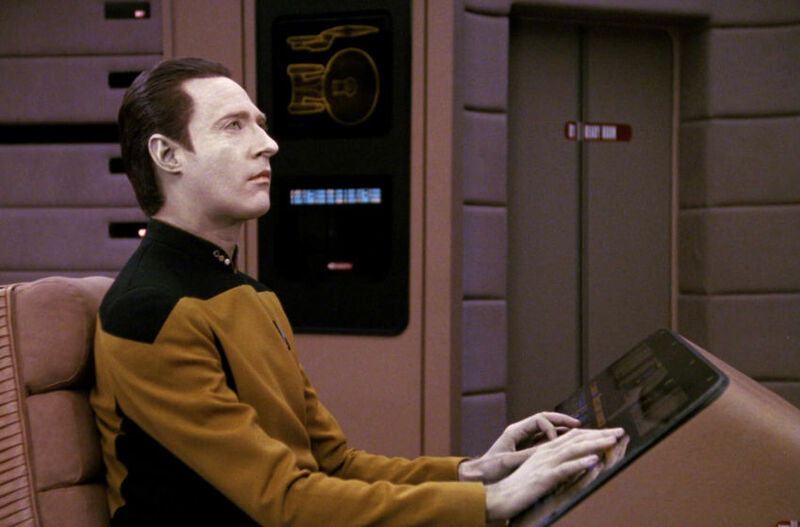 Geordi responds to Data by attempting to explain Kwan’s suicide, rather than address the concepts of suicide and mental illness as a human condition. Whether this is due to Geordi’s desire to shelter Data, who serves as a source of child-like innocence aboard the Enterprise, or is more reflective of the writers’ hesitance to fully delve into these concepts, is unclear. We could also argue that Geordi’s response to Data is based on his own inability to comprehend the reason for Kwan’s suicide. Geordi tells Data that maybe Kwan felt there was something wrong with his life, something he was “powerless to fix.” This may be a simple deduction of more complex symptoms of depression, e.g. feelings of helplessness; however, it still presents viewers with a representation of suicide that keeps it at a distance: an unknown, mysterious tragedy with no clear cause. To fully destigmatize suicide and mental illness, the writers of Star Trek should provide more insight into the study and treatment of mental illness beyond our century, present the viewers with scientific evidence instead of solely emotional. In a way, the plot of “Eye of the Beholder” pushes the episode even further from accomplishing this, as the crew discovers the real reason for Kwan’s suicide was the result of an empathic echo. This strips Kwan of all agency in taking his own life and provides a neat and tidy answer to Data’s earlier question; however, in reality this is often not the case. There isn’t always a suicide note or a definite reason why, and it would have been interesting for Star Trek to address that. This integration of negative behaviors and patterns make it very difficult for a person struggling with mental illness to break the cycle and reform these brain functions, which is why therapy is a necessary part of treatment for mental illness. “Eye of the Beholder” scratches the surface of this principle by giving Data the platform to describe how he overcame problematic brain patterns during his creation. It is ironic that the most genuine discussion of mental illness and suicide comes through the voice of an android and not a human crewmember. In this way, Star Trek is still challenging us to think seriously about mental illness today, even if the rest of the plot may distract from this powerful message.